Prescriptive analytics is the third and final stage of business analytics dedicated to finding and suggesting (i.e., prescribing) the best decision options for a given situation. Prescriptive analytics encompasses the activities of (1) data collection and consolidation, (2) information extraction, (3) forecasting, (4) optimization, (5) visualization, and (6) what-if analysis for first making predictions and then, based on these predictions, (a) suggesting the most appropriate time-dependent decisions (i.e., prescriptions) and (b) illustrating the implications of each decision option. 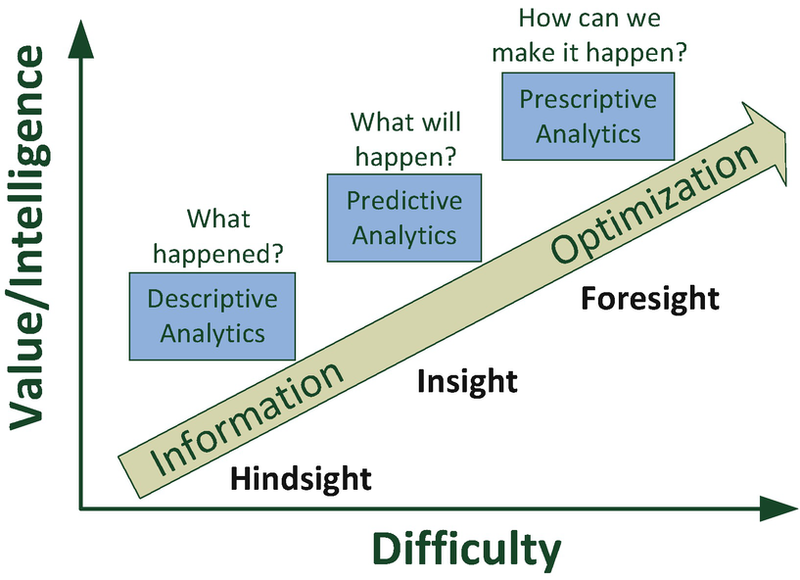 Descriptive, predictive, and prescriptive analytics are the three stages of business analytics [ 1], characterized by different levels of difficulty, value, and intelligence (see Fig. 1).